For Earth Day, Chipotle is turning old marketing into sustainable goods that are in turn part of new marketing plus some philanthropy. Specifically, the Denver-headquartered QSR, which emphasizes fresh, sustainably sourced ingredients, is “upcycling” its old billboards into reusable lunch bags. Fans who buy a bag between March 26 and April 14 -– selling exclusively on Chipotle.com ($18) -- will receive a barcode with the bag that’s redeemable for a free Chipotle menu item (burrito, bowl, salad or taco) on Earth Day (April 22). In addition, a portion of the lunch bag sales proceeds will go to The Chipotle Cultivate Foundation, which provides funding to support sustainable agriculture, family farming, and culinary education. That foundation was launched last August with the debut of “Back to the Start,” an animated short featuring Willie Nelson’s cover of Coldplay’s “The Scientist.” (Each purchase of the song on iTunes generates 60 cents for the foundation.) The video, which was shown online and in movie theaters before making a splash as a commercial on this year’s Grammy Awards, has now been viewed more than 6 million times. 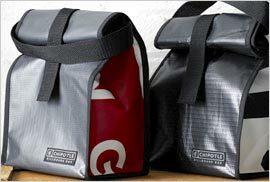 The lunch bags were designed for Chipotle by sustainable apparel firm Loomstate, and made by Denver-based Billboard Ecology Partners. Actual parts of Chipotle billboards can be seen on the bags’ side panels, making each bag unique. Billboard Ecology, which recycles billboards into a variety of items, most of which are then sold for fundraising by schools, has to date diverted more than 1 million square feet of Billboard and banner waste into durable products, using less energy than traditional recycling methods. Every 20,000 bags made for Chipotle –- which are printed on tree-free stone paper made from limestone salvaged from construction sites and quarry waste -– will keep 78,000 square feet of billboard vinyl (the equivalent of 2.7 Olympic swimming pools) out of landfills. The number of bags available for sale is limited.